Terry: So, we are here to talk about the America Cup today…the aftermath and the astounding Oracle win. What made the difference at the end of the race. What did they do that made such a difference. 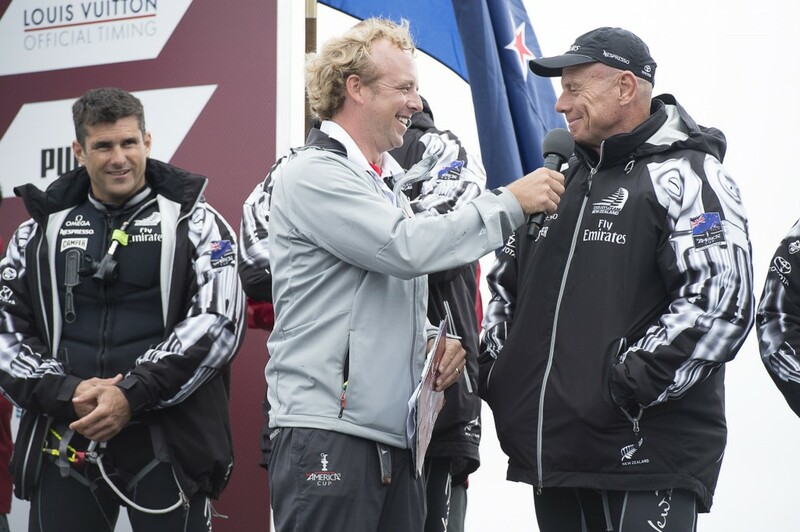 Andy: Well let me say, that the America’s Cup match race are usually one sided affairs. The faster boats nearly always dominate. Sometimes the faster boat gets a slow start, such Australia II in 1983 is a good example. It was the faster boat, but they struggled to get it going until they needed to at the end. I think Oracle was a good example of that, they always had the faster boat. The American boat was quicker but much harder to sail. It had a lot of clever design elements that made it a faster designed boat. It was a struggle on how small their foil were, how little drag they were trying to introduce and t how stable the boat was. In the end it was a very interesting design conundrum. The New Zealander’s had a slower boat but easier to sail. The New Zealanders went for a more solid or a more sail-able boat design. The race between the two was always touch and go for Oracle to see if they could “tame their tiger” so they could catch up to the New Zealander’s. The New Zealand crew was a much more race practiced crew. Oracle very nearly got to the point where they couldn’t catch up any more. In a short summary, it was just amazing. There were two significant moments in the race. One was the time limit that the Kiwis ran out on which they could have won on. They could have used a couple knots of breeze around the race course. The second moment was…I believe it was September the 16th…. that the Kiwis agreed to a day off. They have since commented that perhaps they shouldn’t have agreed to that. They should have kept on charging along while they were ahead. They rather lost their momentum. Those were the two significant events. Oracle changed their crew and changed their strategy, which all helped incrementally them to win. Terry: So, it wasn’t just one big thing they did to the boat that helped Oracle win? Andy: No! They weren’t making any big changes. You can only make so many changes in a 24-hour period. It was really tweaking. The most important thing is that they got better control of their foil and the Center board. They had a difficult system that they refined so that in the end it was quite a good system with easier control…. in smaller increments of angle adjust. That is what the Americans were talking about. It was called the “Herbie”. It wasn’t anything hugely revolutionary. It was just a different way of the bow working. It was perfectly legal. They just figured out how to best make it work for them. This helped a lot. They also changed some things in the sailing crew. It took Kyle a while to figure out how to best trim the wing. If you go back and look at some of the footages of the earlier races, the wing was trimmed very flat. In the later races, the wing was trimmed with a lot more depth in it. This led to quite a lot more loading in the boat and this lead to them sailing 5 degrees lower which made the boat to jump up its foils earlier and go faster. It was a combination of Kyle getting more comfortable on trimming the wing and how they trimmed it and putting the bow down and going fast which is something that Tom Slingsby very much advocated. When Ben Ainsley cam on board as Tactician, he said, let’s try it. They tried it and it was a success! So the one-sided America’s Cup was also one sided but in a completely different way with two totally different boats. And so it was a totally different race. The two boats met in the middle and it came down , as you saw, to one race! Terry: So it sounds like it came down to some small adjustments and momentum. Andy: Right. It came down to a combination of boat changes, crew changes, the way they sail the boat changes, refinements to their tack and their systems, a momentum change. All those changes added up to their last gasp and a come back. That’s what made it exciting. Watch for Part II of our Interview with Andy and his thoughts on where America’s Cup Will go in the future.